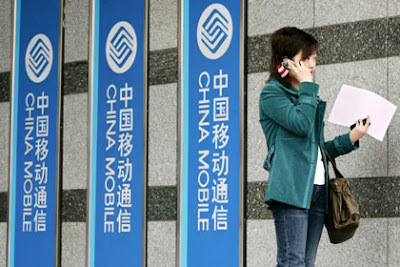 China Mobile today posted a sizeable hike in its operating revenue in the first half of 2007, to RMB166,580 billion ($22 billion) an increase of 21.6 percent over the same period last year. EBITDA and profit attributable to shareholders reached RMB89,814 billion and RMB37,907 billion respectively, representing an increase of 14.6 per cent. and 25.7 per cent. Total subscribers as of June 30, 2007 are 332,378,000,000, as the company shifted its focus to more growth in rural markets. --Boost in non-voice products: Value-added services revenue grew by 35.5 percent to RMB41,915 billion ($5,516,220,306). In total VAS makes up 25.2 percent of China Mobile’s total operating revenue. --Even if ringtone revenues are leveling off in some markets, there is no sign of this happening yet in China, as the VAS that saw the most growth was China Mobiles “Color Ring” ringtone service, which went up to RMB5.027 billion ($661,708,569)—a whopping growth off 90.3 percent of the first half of last year. WAP revenue was up by 45.8 percent to RMB4.435 billion ($583,781,535); MMS was up by 76 percent to RMB713 million ($93.8 million). --Mobile music also saw huge growth: In a market rife with piracy, China Mobile and other operators are being wooed big-time by record labels who believe they may be the one last outpost against their ongoing copyright infringement wars. It looks to be paying off for now: CHL’s mobile music service picked up 31 million customers in the last six months, bringing the total number of subs to 48 million. Premium subscribers now total 22 million. China already has the world's largest number of mobile phone users and the market is expected to grow rapidly in coming years as incomes rise. Chinese mobile phone subscribers should reach 520 million this year, up from 460 million in 2006 and it should exceed 600 million by 2010.
www.telepin.com i wonder if you know any other companies for mobile payment and mobile topup service.